Videocon added a new affordable tablet to its product portfolio. Dubbed as VA81M, this is a 7 inch voice calling tablet and will come with a price tag of Rs. 4,900. VA81M will be offered in black color option. 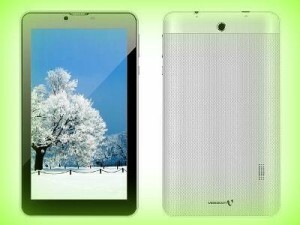 Mumbai: The latest tablet from Videocon, VA81M sports 7 inch display with resolution 720 x 1280 pixels. It is powered by 1.3 GHz dual core processor whose clock speed is 1.3 GHz. The processor is paired with 512 MB RAM and the internal storage is 4 GB. Memory can be expanded up to 32 GB via micro SD. It features 2 megapixel primary camera and VGA front facing camera. The tablet runs on Android 4.4.2 Kitkat operating system. Connectivity features of the handset include WiFi, Bluetooth and 3G. Other features are 3.5 mm headphones and micro USB charging. This tablet comes with dual SIM capabilities and has 3000 mAh battery under the hood. The battery is claimed to deliver 96 hours standby time and 8 hours talk time. Videocon VA81M is yet another 7 inch affordable tablet that comes with preloaded apps such as V-Safe app, V-secure antivirus app, Opera Mini and so on. Videocon claims that the tablet offers flawless gaming and multimedia experience. The new tablet however has very low RAM and internal storage. The device is now available online on various e-commerce sites. This entry was posted in Launches, Tech on June 4, 2015 by Rakesh.